I was going doing some travelling that would involve some camping and trekking. It had been a while since I had embarked on such adventures, but I knew a penknife would be a useful piece of kit to have on my person. It’s one of those useful items that you probably won’t use an awful lot, but it’s not any real inconvenience to have on you, so you’re better to be with it than without it. I had an unbranded pocket knife when I was a kid in the Scouts, but that could have been anywhere, and I had it in my head that the sides had broken off anyway. I opted for spending a few bucks on something decent. Victorinox are by far the most original and well-known brand, but there are many brands and products in the category available these days. I did some thorough research and found that most of the other knife brands were too fancy, too obnoxious looking, or too brittle feeling, like they wouldn’t cut through string from Dollar Tree. Eventually, I opted to go with a Victorinox. There were so many options, I needed to start filtering somewhere! The fact that Victorinox is such a well established brand seemed as convenient a place as any to start. Brands don’t stay around for so long if their products are not up to par. 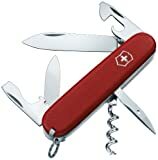 But that in itself presented another pickle: the sheer number of models that Victorinox have within their brand. How do I start? Well, given the nature of what I was doing, I didn’t want one of the bulkier models. It’s all very well being blown away by the cool stuff that’s included on them, but you do have to reel yourself in, and try and be realistic about what I might actually use on my trip. But, I didn’t want to get something that was so diddly that I’d lose it, like, in the grips of my boots, or in my rucksack or something. I know. It mostly sounds like I just wanted to have my cake and eat it too. After looking through all the models available, and weighing it up against what I needed, I opted for the Spartan model. It was a nice size, had a sensible number of tools included, came in a nice traditional red finish, and was reminiscent of MacGyver’s. All of those points are important, but not in any particular order. The Spartan really is your classic and quintessential Swiss army knife. I can’t confirm if the Swiss army actually uses it, but it is made in Switzerland, a country renowned for their high quality craftsmanship. I mentioned its size as being one of my priorities for it. The Spartan is 3.58” long, 0.61” high, and weighs 2.081 oz. That’s not bad. It’s far from heavy, far from being uncomfortable in your pocket, and just the right size and weight for you to know it’s there, so that you would missit if it wasn’t. What’s actually on the pocket knife though? Well, it’s probably stating the obvious to point out that it has a blade that runs the length of the chassis. It also includes a smaller blade, two screwdrivers, can opener, and corkscrew. The most you’ll likely use on a camping or hiking trip will be the blades and the can opener. If it’s a short hike and you’re old enough, you may bring a few bottles of beer or wine with you, where you may use the bottle opener or corkscrew. For serious trekkers, though, they’re not an especially practical use of your space or rucksack weight. In a more civilian capacity – which I think it’s safe to say is where this pocket knife will get the most use – it’s still incredibly useful to have this around. I certainly still find use for it. A great example is barbecue season. If you have this outside by your grill, you’re sorted for opening packets of burger buns and opening drinks. Even outside of barbecue season, I’ll tend to approach any repairs around my apartment with my pocket knife before hauling out my full toolkit. You can get the Spartan in a number of finishes, but I opted for the classic red. It’s really is an ideal piece of kit to have in your possession, whether you’re going hiking or camping, or just to generally have around your home.